There was no one more committed to the welfare of his community than Ike Bayles and the community benefitted from his talents. Isidore Bayles was born in Libau, Lithuania in 1876, the youngest of six children born to Rabbi Ephraim Bayles & Ida Rashe Friedman. He came to America, in 1891, at the age of 15. In 1898, Isidore Bayles journeyed to Victoria, British Columbia for the Klondike Gold Rush. In 1903, Bayles opened a clothing store in Dawson, British Columbia, selling to the vast number of miners and pioneers that had settled in the area. Around 1905, Isadore Bayles moved to Fairbanks, as the Dawson City population dropped or moved on to other potential gold areas. In 1910, he opened a clothing store in Fairbanks with Abe and Charles Isaacs. In 1911, Bayles opened a clothing store in Iditarod with the Isaacs brothers, as a new gold find was announced and the prospectors rushed in. In 1915, Bayles moved to Ship’s Creek Landing — which soon became Anchorage. There he opened his men’s clothing store, I. Bayles Clothiers, at the corner of 4th Avenue and D Street. This store was located next door to his lifelong friend, Zachary Loussac and his pharmacy. Bayles owned this business with a partner, Nathan Jaffe. The store was sometimes called Jaffe & Bayles — Leading Clothier. From the 1920’s thru the 1940’s, “Ike” Bayles traveled back and forth between his Fairbanks and Anchorage stores. Eventually, Bayles bought out Jaffe’s share of the business and his store became I. Bayles Clothiers. 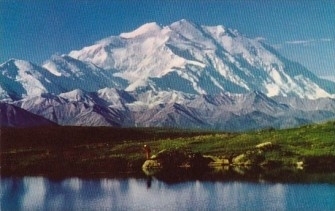 Everyday View from Downtown Anchorage, Vintage Postcard. In 1925, Bayles invested in the Anchorage Times newspaper and, ten years later, served as President of the paper — a job he held for 15 years. In 1950, Isidore Bayles retired and moved to San Francisco, where his younger daughter, Dorothy, lived. In 1911, Isidore Bayles became a member of the first City Council after Iditarod was incorporated. In Iditarod, Bayles served as Chairman of the Fire Committee and was a member of the Street Committee and the Law and Order Committee. In 1922, Bayles was elected to the first City Council of Anchorage. He served 8 terms on the Council as Chairman of the Finance Committee. During his term, the City of Anchorage was kept out of most indebtedness and was on a solid fiscal foundation. There was no question that the reason the town was solvent was due to Bayles’ financial policies. First City Council of Anchorage, Ike Bayles is seated 2nd from right. Bayles also served for 20 years as the Chairman of the Anchorage July 4th Celebrations. 1940’s Parade Passes Ike Bayles’s Store in Anchorage. Isidore Bayles was a Mason, who served as Vice-President of the Iditarod Masonic Club. In 1909, Bayles worked with the Jewish community to build a congregation called Chevra Bikur Cholim, and served as its first President. Bayles led services at Isaacs Bros. & Co. Men’s Store in Iditarod, Alaska. He purchased a Sefer Torah as well as other religious books for the Jewish community. On Passover, Bayles presided over the community Seder. In 1909, Isidore Bayles married seventeen year old Beatrice Swartz. They had two daughters: Edith Rose (b.1911) and Dorothy Progress (1912-1957). Isidore Bayles died, in 1956. He is buried at the Mt. Zion Cemetery in Colma, California. In 1957, Dorothy and Edith donated Isidore Bayles’ Torah Scroll to the Anchorage Jewish community. In 1977, the City of Anchorage renamed two streets near Bayles’ clothing store, at 4th Avenue and D Street, Ike Bayles Way and Bayles Plaza. The now famous Iditarod Trail Sled Dog Race begins in front of once was “Ike” Bayles’ clothing store. Matthew Eisenberg, “The Last Frontier: Jewish Pioneers in Alaska Part III,” Western States Jewish History 24/3. Samantha Silver is curator of this Isidore Bayles exhibit.